IMPORTANT: While this is a short and easy hike, it is only accessible 1.5 hours before and after low tide. Use a tide-tracking website or app like "Tide Chart" to make sure that you can make it onto and off of the island safely. Rating: Short and easy family-friendly hike. Access: Bridge Street in downtown Bar Harbor. Length: 2 miles out and back. Elevation Change: 160-foot gradual elevation gain to high point on Bar Island. 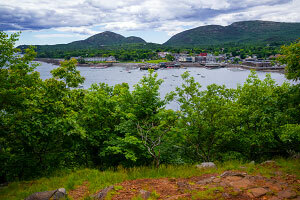 To start this hike, park anywhere in downtown Bar Harbor, preferably near the northern part of town close to the water. Walk to Bridge Street which is a few blocks west of the touristy marina area. Walk north on Bridge Street which leads right to onto the bar. Head north along the bar towards the island; children may enjoy wandering along the bar looking for signs of life in many of the shallow tide pools. Once on the island, you will be greeted by an NPS sign for Acadia National Park and you can hike the short Bar Island Trail to explore the forested island. 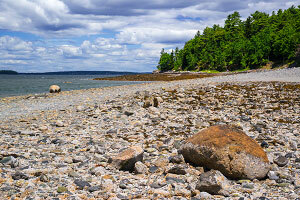 The trail follows an old dirt road east to the high point of the island which offers a nice view back at Bar Harbor and the nearby mountain peaks of Acadia. The middle of the island also has an open meadow brimming with wild lupines; the early summer bloom of flowers is a wonderful sight. When you have had your fill, return the way you came and get off the island before high tide starts to roll in! 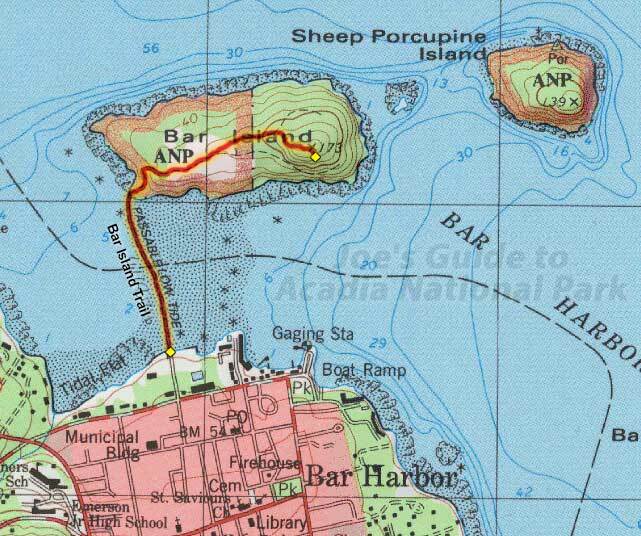 The hike out to Bar Island is a nice leisurely stroll that most people will enjoy, including the hike to the high point of the island. Unlike some of the somewhat remote hikes in Acadia, however, since Bar Island is so accessible, be prepared to share the trail with a lot of other tourists and hikers. Some people even drive cars out to the island, although this is not recommended.